Perfectly Created Chaos! : "Follow Your Heart"
Hope you are all having a good week so far. Mine has been crafty, and relaxing since the hubs is out of town at the moment. 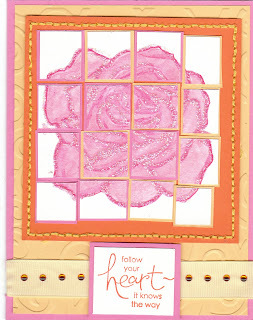 I made this card last night while watching all of my favorite CBS shows: NCIS, NCIS:LA and The Good Wife. I used Regal Rose, So Saffron and Pumpkin Pie, which were colors actually inspired by a challenge over at Play Date Cafe; but it's too late for me to link the card there. Oh well, it still gave me inspiration! I followed the sketch over at Tuesday Morning Sketches. It was a fun sketch and one that could definitely be used again! 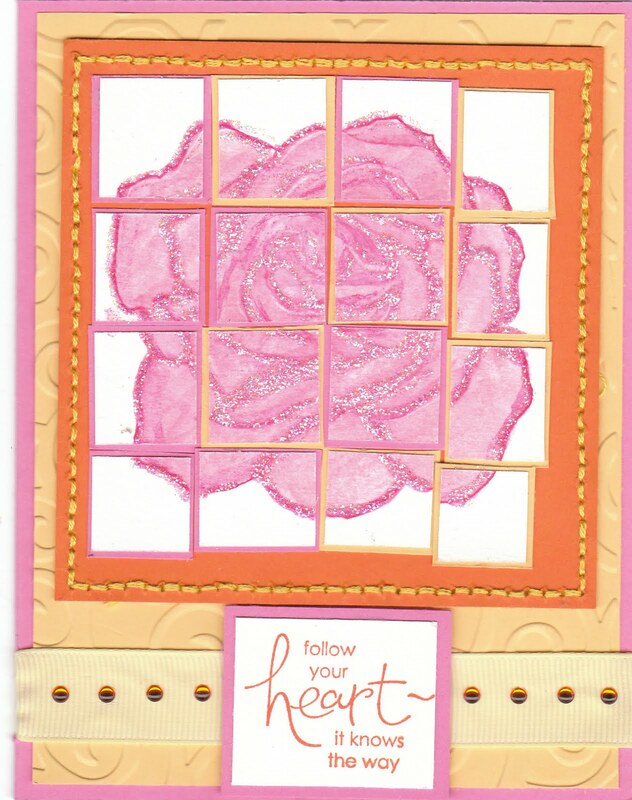 I used some stickles to go around the outline of the flower to make it all sparkly, which I did for the challenges posted over at Paper Take Weekly as well as Craft Your Passion. I really really wanted to put some buttons or a bow down at the bottom; but I resisted the urge and decided to put some orange little blingy stickers along the bottom on the Vanilla Ribbon. This means I can use this card for the Flourishes Timeless Tuesdays "No Buttons or Bows" challenge. Ok, so I'm off to link up my card at all the appropriate challenge sites and to do a bit of blog hopping. Have a great day! Thanks for visiting me! great take on the sketch... love the stitching and little buttons too! This is lovely! I love the sentiment, too. Thanks for joining us at Tuesday Morning Sketches. this is beautiful.. love all those pieces ;) great job! Thank you for participating in our challenge at CRAFT YOUR PASSION :) GOOD LUCK!